Location: At Williams Lake turn west onto Hwy 20. About 21 km (13 mi) west of Riske Creek turn off Hwy 20 onto the Alex Graham Ross Forest Access Rd. to Raven and Palmer Lakes. Raven is located 16 Km (9.9 mi) on the road. Watch for logging trucks. 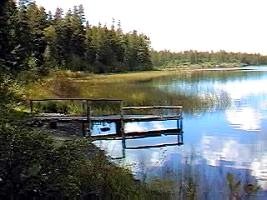 Resorts & Campsites: There is a large BCFS campsite which is RV accessible. A gravel boat launch is also provided. Motors are restricted to 10 h.p. Fishing Report: Eastern Brook Trout averaging around 2 lbs. Rainbows up to 5 lbs, and sometimes larger. Trolling with wedding bands, hotshots and spinners is popular. However, Raven can also be an excellent fly fishing lake. A very popular ice fishing lake. Viewscape: Raven is surrounded by hilly Lodgepole Pine forest. Some logging in the area. Shoreline: Soil with 50% rock. 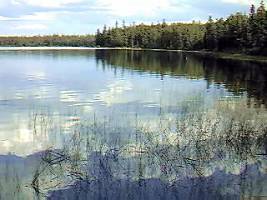 Shoreline is mostly forested with isolated swamp areas. Water killed trees in up to 6 ft of water surround the whole shoreline. See Beaver Lake and Palmer Lake.